Discover professional-level sound design techniques in a demanding production environment that closely echoes the industry. Vancouver Film School grads are some of the most successful and sought-after professionals in the entire Sound Design industry. You will find our alumni working all over the globe, pushing boundaries, discovering new frontiers, winning all kinds of awards and honours, and leading today’s creative economy. Discover the current industry practices in audio, and familiarize yourself with the main audio tool of the industry, Pro Tools. Implement concepts, theory, and tools from the previous term in projects that involve editing background audio, Foley, dialogue, and sound effects. Explore more complex techniques and concepts, and gain practical knowledge in game audio while working on a Game Design-created game. Expand on your skill sets with practical knowledge while working on a film with students the Film program and a game from Game Design students. 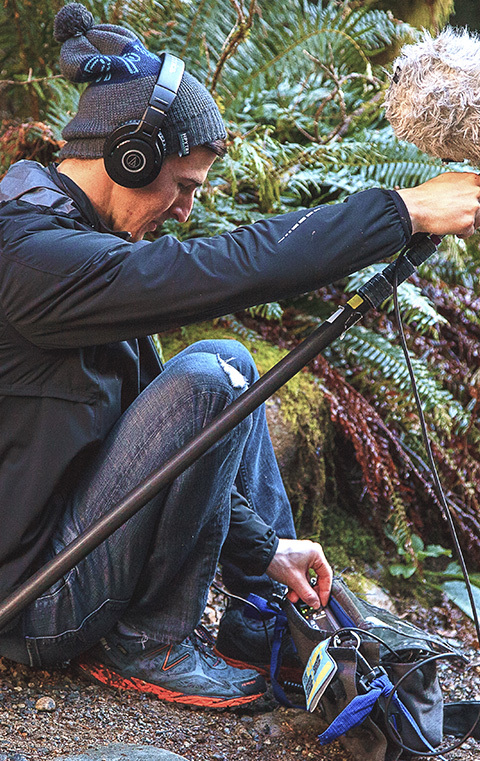 Become more self-directed as you delve deeper into sound for film and game audio. Present your final portfolio work to an industry panel for feedback and industry prep training to direct your path after graduation. Write us a letter demonstrating why you wish to take the Sound Design program (maximum 500 words). You'll find information on how to submit requirements in the application form, or you can ask your Advisor. While training at VFS, students are immersed in the Sound Design for Visual Media industry, and spend a lot of hands-on time creating professional-quality work. And, nothing is a greater testament to the incomparable industry resources and career preparation that define VFS’s education model, than the top quality work our students produce. Here, a portfolio of outstanding work is just the beginning. Just take a look. VFS doesn’t just teach you about the industry, it IS the industry. With veteran instructors, mentors and an education Advisory Board recruited straight from the professional world, we are able to constantly update our award-winning curriculum to keep up with an ever-evolving industry. Plus, students also have lots of opportunities to connect and network with industry leaders during special workshop sessions, training presentations, and industry social events hosted by VFS. VFS Sound Design for Visual Media is an Avid Learning Partner. Sound Design students will receive Avid’s 101 & 110 Protools curriculum which offers the ability for students to become certified Avid Protools users. Located in downtown Vancouver, the Sound Design for Visual Media campus offers students all the industry-leading tools, learning resources, and production space for developing professional-level portfolios. The close proximity to other VFS campuses – such as Film Production and Game Design – helps foster the spirit of interdisciplinary collaboration. This area is also home to some of the world's leading video game developers and film and TV productions. "VFS was the launching point for my career, it was the turning point that took me from a small town to traveling the world doing what I love, creating engaging experiences. The contacts I made and the guidance of the Instructors were a key factor in why I am where I am today. I hold a recommendation for a student from the instructors at VFS in the highest regard and will continually look at hiring alumni from this school as a source for people I would want to have on any team, it is a breeding ground for talented, passionate and reliable people." "At the end of the Sound Design program, a number of local industry professionals came to hear our final projects and provide us with critical feedback. At this event, one of the industry professionals was the VP of a local post-production studio. He asked me to come see him after graduation to discuss potential contract work. We reviewed my demo reel at this meeting and the next day I was working." "I learned more in my one year at VFS than I did in my four years as an undergrad at university." "The Sound Design program at VFS allowed me to completely reinvent myself. I went from a boring, mindless job to a challenging and creative career. I was able to apply practical knowledge from the Sound Design program into a variety of film, TV, and game projects."